Browsers are like gods of the internet; it feels incredible when we skeptically think how just a few codes let us virtually access the world on our fingertips. Statically Google’s Chrome is the market share leader with 62.5% followed by Apple’s Safari at 13.8%. Over the last few years, many browsers have tried to dethrone Chrome but have failed because numbers of windows users are increasing day by day. These numbers indicate people’s interest in browsers and OS, but are we neglecting something crucial here? Apparently, Yes. Security and Privacy are often overlooked over convenience. One should never underestimate the importance of online privacy and security, especially when using the internet. The runaway market leader: Chrome. Former most used: Microsoft Internet Explorer. An Open-Source Version of Chrome: Chromium. Each browser will be rated out of five and will be ranked accordingly. It was a trusted browser for many before the release of Chrome. It had near monopoly on browsers like Firefox and Safari. There was a time when internet explorer (IE) ruled the internet, but the wheel of fortune turned, and now Microsoft is urging people not to use IE. Security Features: Internet Explorer is one of the less secure browsers available. Although, internet explorer warns users when they visit a potentially harmful website and it has adjustable security features that can aid in online protection. Still, the features offered by IE are not up to the mark as compared to its competitors. Privacy Tools: Internet Explorer allows toggling pop-up blockers just like Chrome and also sends a “Do Not Track” request to the site you visit and also to the third-party whose content is featured. Additionally, IE features a Tracking Protection which lets you subscribe to tracking protection list. This intimates the browser to prevent listed sites form bombarding cookies on your browser. However, IE is a closed-source, so there is no way someone can tell what sorts of surveillance widgets are being used in the browser itself. It was developed by Hakon Wium Lie in 1995. The man that developed Opera was also the creator of CSS web standard. Opera has much in common with Chromium; its browser has adopted much of Chromium’s code which makes Opera a trusted browser for privacy advocates. Security Features: Opera is house to many security features that can boost the browsing experience and make it safer. Malware and Fraud protection, blocking scripts and numerous add-ons make opera a secure and strong alternative for Chrome. Privacy Tools: Opera does not feature many customized tools to enhance privacy and security; it thinks that many users do not feel comfortable with a browser that provides such features by default. You can consider choosing the fastest VPN for anonymous browsing and secure internet surfing. It’s been ten years since the Chrome launch, and it has been an undisputed champion in the browser market share. Given that it has a firm reputation over speed and involvement of Google’s product like Gmail, YouTube and Google Docs in our lives, it is important to evaluate how this browser giant performs on our selected criteria. Security Features: Google has a good history of updating its browser Chrome to ensure that its users enjoy swift internet browsing. Talking of security, Google has long been encouraging hackers to find vulnerabilities in its browsers so that the company can find the loopholes and fix them to improve the product. Chrome also scans anything that is downloaded to minimize the risk of virus infection. Privacy Tools: Google Chrome does have a usual pop-up blocker that sends “Do Not Track” request to the website and third-party that sends the content, but one cannot ignore that Google knows a lot about you. Google chrome contributes so much in telling about you to the company and then monetizes that information to serve you with ads. A prominent example is of Google’s fishy location history policy and the way the browser logs you in automatically whenever you wish to use Chrome. Safari might sound different to Windows users, but this Apple browser has been featured on PC since 2012 after which it became available for Apple devices. Although Safari is the default browser for Mac, it is facing the same fate as of Internet Explorer as Chrome is sweeping them all. Security Features: Safari does a decent job in protecting its users. It prevents suspicious websites from loading and alerting the user of a potential threat. Safari also prevents malicious codes from affecting your browsing experience by running web pages in a sandbox. Its new feature named “Password Generator” dissuades users to use old passwords. Overall it performs above average in terms of security. Privacy Tools: The recent update by Apple has really up the game for Safari in terms of privacy. Features like camouflaging from digital fingerprinting; intelligent tracking protection and an array of useful add-ons are introduced to enhance user’s online privacy. Safari recently discontinued the use of “Do Not Track,” and it is a closed-source platform; this would not be the case then it would have scored 5/5. Learn more about How you can improve the cybersecurity? Google Chrome is an open-source platform, but some of its proprietaries come with specific Google code which makes it a semi-open-source platform. Chromium is a pure Open-Source version of Chrome which caters more privacy and is perfect for people who want to benefit from open-source Google platform. Security Features: Since Chromium is an open-source platform user can check by themselves if any vulnerability is patched. Before you opt for Chromium, be sure that you download the software from the verified source, there is so many malware masquerading under the name of Chromium. Privacy Tools: Neither Chromium nor Chrome allows you to disable WebRTC; this leaves users vulnerable to WebRTC leaks. Users can use a VPN service to fight back and to prevent a WebRTC leak. There is one thing where chromium excels from Chrome in terms of privacy; it does not send the data to Google. Out of all browsers in this list, only Firefox is the one that is developed by a nonprofit company named “Mozilla.” Mozilla Firefox is acclaimed for customizability and is a long-favored alternative to Google, Apple, and Microsoft. It has released a version named “Quantum” which is hyped to be the most privacy-oriented update yet. Security Features: Mozilla Firefox offers a wide range of security features that any internet user will appreciate. Its features include; Malware and Phishing protection, warning users when a site wants to install the add-on and blocking web forgeries. Firefox users can relax after knowing that their browser is one of the most secure amongst its competitors. Privacy Tools: Firefox features ‘Content Blocking’ which allows users to block the trackers that the browsers detect. It offers a wide range of add-ons to its users who want to up their online privacy game. Since Firefox is the only open-source browser that is widely used so anyone can examine what source code is running and make sure no tracking software has its footprints on the code. The Tor browser was developed in 2002 to ensure that users browse the internet anonymously. When using a Tor browser your activity and identity keeps hidden as everything you do is encrypted via three layers of network relays. Security Features: A tor browser is highly regarded when it comes to security, as no one can track your internet activity and know your real identity unless you explicitly reveal it yourself. Tor browser also protects its users from websites that use fingerprint browsing history by integrating NoScript. Privacy Tools: The process of protecting your data through three layers of relays makes it incredibly difficult for anyone to trace your activity. However, Authorities and ISPs can see who is using tor, but they cannot see their activity. 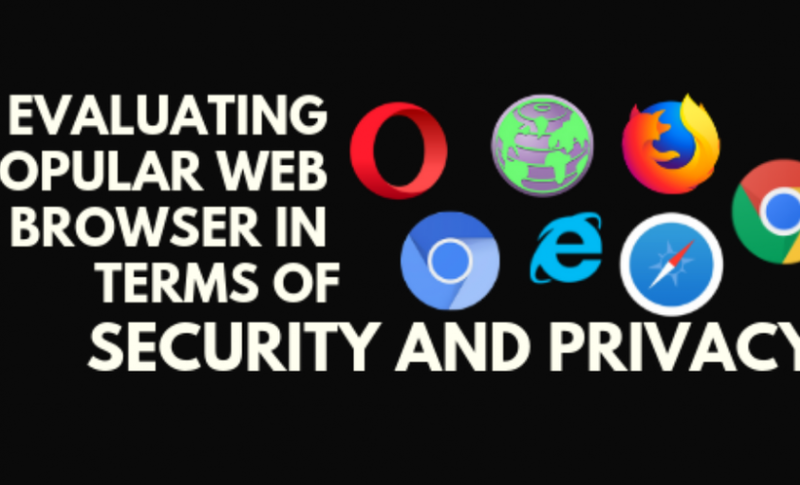 The browsers above have their respective strengths and weaknesses; they try their level best to give you a secure and private browsing experience and succeed in some ways. If you need surefire protection and want to access restricted websites, then go with a VPN.